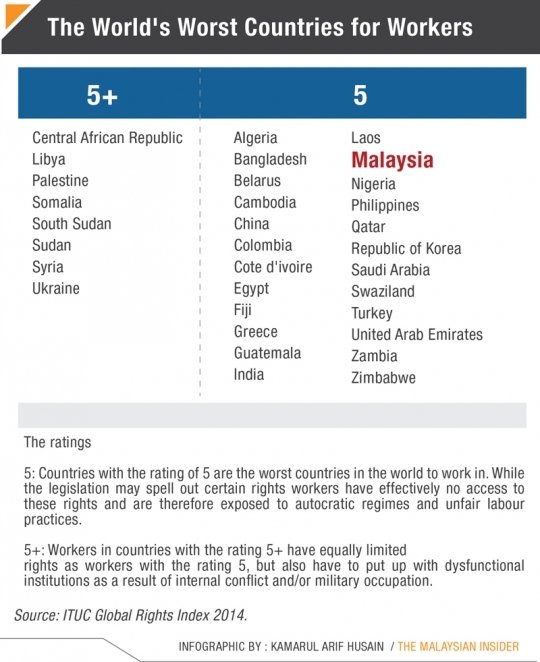 Malaysia joins the list of countries deemed the worst places in the world to work in as it does not guarantee workers’ rights, according to a survey by the International Trade Union Confederation (ITUC). In its first-ever Global Rights Index report, compiled from 97 indicators, Malaysia scored 5, joining Cambodia, Bangladesh, China and Nigeria and 19 other countries. A “1” is given to the best countries and “5” for the worst. “Countries with the rating of 5 are the worst countries in the world to work in. While the legislation may spell out certain rights, workers have effectively no access to these rights and are, therefore, exposed to autocratic regimes and unfair labour practices,” said the report released in Berlin. As of 2012, there is an estimated 12.9 million people in the workforce in Malaysia. An estimated 6.44% are members of trade unions, of whom about 53% are private sector workers, 38% public sector workers, and 9% workers of statutory bodies or local authorities. A recent example of alleged violation of workers’ rights involved national carrier Malaysia Airlines. MAS took disciplinary action against Mohd Akram Osman, secretary-general of the National Union of Flight Attendants Malaysia (Nufam), and 30 other Nufam members for an “illegal gathering”. 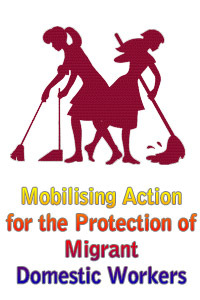 The move was criticised by many, including civil society, and other trade unions. They called on MAS to recognise and respect workers’ rights, including the freedom of association and the right to join a union. Meanwhile, 18 countries, including Denmark, Norway and Uruguay, scored a 1. 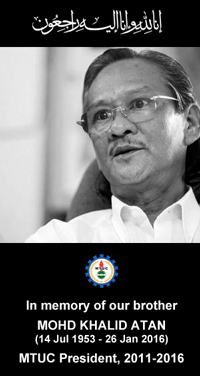 “Collective labour rights are generally guaranteed. Workers can freely associate and defend their rights collectively with the government and/or companies and can improve their working conditions through collective bargaining. Violations against workers are not absent but do not occur on a regular basis,” it said about the 18 countries. The survey covers violations in 139 countries recorded between April 2013 and March 2014. Neighbouring Singapore scored a 3, meaning that its government and companies regularly interfered in collective labour rights and failed to guarantee important aspects of these rights. Among the key findings in the ITUC report were governments of at least 35 countries have arrested or imprisoned workers as a tactic to resist demands for democratic rights, decent wages, safer working conditions and secure jobs. In at least nine countries, murder and disappearance of workers were commonly used to intimidate workers. Eight countries, including Somalia, South Sudan, Palestine and Ukraine, with the most severe violation of workers’ rights were given a 5+ score – which effectively means that there was no guarantee of rights because of the breakdown of the rule of law. “Workers in countries with the rating 5+ have equally limited rights as workers with the rating 5. However, in countries with the rating 5+, this is linked to dysfunctional institutions as a result of internal conflict and/or military occupation. In such cases, countries are assigned the rating 5+,” ITUC said. – May 23, 2014.